The courses in this stream will enhance the skills required for activities with individuals or groups who have been directly or indirectly exposed to trauma. Successful completion of the following courses (or equivalencies) is required for COMMUNITY & WORKPLACE TRAUMATOLOGIST Certificate of Completion: TI-1001, 102 – 107. A blend of face-to-face or on-line courses is accepted. Before enrolling in course 106, participants must complete 1001, 102-105 and 107. Those who successfully complete the full Community & Workplace Traumatologist training curriculum are entitled to use the TITC-CWT designation (which stands for Traumatology Institute Training Curriculum, Community & Workplace Traumatologist). Designed for professionals, paraprofessionals, and volunteers who work with trauma survivors or trauma-related response activities. No special requirements or degrees are necessary for this entry-level non-counselling training stream. For the downloadable CWT course outline, click here. All courses remain active in your student account for 160 days after the date of enrollment. We recommend that the courses in each curriculum series be taken sequentially in numbered order. All the assignments and learning in the Community & Workplace curriculum rely on an integration of materials from all previous CWT courses. All of the courses offer opportunities for learning through online exercises, assignments and unit quizzes but many are simply for your learning only and are not submitted for grading. Assignments from the final Supervision course in the CWT series (TI-106) will be reviewed and considered on a pass/fail basis only by Traumatology Institute staff. These submissions, along with the successful completion of core curriculum, will satisfy the requirements of the program. Each course requires the successful completion of a Final Quiz. Your grade must be higher than 80% to pass these quizzes. When all of the courses are completed a Certificate of Completion in your selected stream will be made available on the E-learning site. You will be able to print your own Certificate of Completion from any computer linked to a printer. 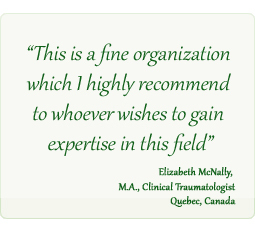 Our certification is provided through Traumatology Institute but you can also apply for additional international certification through the American Academy of Experts in Traumatic Stress (AAETS) and Green Cross Academy of Traumatology in the U.S. 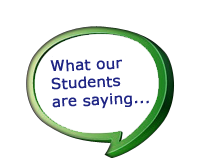 They both acknowledge our training and provide advanced certification.